GBC1 Plastic crate has a solid top and bottom. Bottom has micro texture to give birds traction. There is a 12” opening on all 4 sides for hinged doors with spring latches. Doors can be mounted for right or left hand operation. Substitute a flip door on the end for speed in loading/unloading. The crates are stackable with one another. Crate size: 16” w x 24” l x 9 1/2” h. Coops are drop shipped from Pennsylvania. Crates ship within 1 or 2 days after the order is placed. 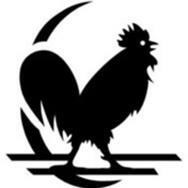 These coops are DROP-SHIPPED from Kuhl Corp in New Jersey. Allow 2 weeks for delivery during peak times. With the exception of coop 16, 1 Kuhl coop ships at the UPS DW rate of 45 lbs. 3 coops ship at the DW of 98 lbs. 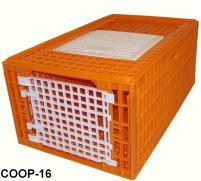 All coops are made of high density polyethylene and can easily be sanitized after each use. Kuhl Corporation continues to redesign & improve their coops so coops may not exactly resemble coops pictured on this page. Coop 16 has 1 end door, 2 side doors, & no end door; holds 4 or more mature turkeys depending on their size & the temperature at the time the birds are being transported. Size: 38” l x 22” w x 16 ¼” h turkey or large fowl coop; 1 to 2 coops ship at 98 lbs. DW. Drop-shipped from Kuhl Corp.
Coops 12 & 13-A are made of high density polyethylene plastic. Coops have a grid bottom & will hold app. 14 adult birds. Coop 12 has 1 hinged lift-up top door. Size: 38.25” l x 22.75 ” w x 10.75” h.
Coop 13A has 1 sliding top door. All coops are polyethylene & can be hosed down & sanitized after using. Size: 38.375” l x 22.75 ” w x 10.75” h.
Coop-6-Q is 26” long x 17 ¾ wide x 4½” interior height. Its low interior height makes it suitable for transporting quail. It has a solid bottom, a lift-up door on the top & a sliding side door on 1 end. Coop 6 will stack with another Coop 6, but won’t stack with a other coops. Holds approximately 25 quail. Coop 6 is drop-shipped from Kuhl Corp.
GQF Quail Coop #0299 has raised corners allow several coops to be stacked several high. Has a solid bottom. Top door with a positive spring latch, is hinged for easy load of quail or baby chicks. Side door slides open for releasing birds. 4 ½” head room prevents injuries as birds do not have enough room to jump up and hit the top. Outside dimensions: 27” x 18” x 6 ½”. Holds 25-35 grown quail. Drop-shipped from GQF Mfg. Coop 7 has a fast-fill top door, a push-in door on 1 end & a quick-release door on the other end; stacks with 8 & 10. Has a solid bottom. Size 38” l x 23” w x 10 ½” h. Holds approximately 14-16 pheasants. Coop 7, Coop 8, & Coop10 are drop-shipped from Kuhl. Corp.
Coop 8 has lift-out doors on top & 1 end; side & top doors measure approximately 8” x 13”. 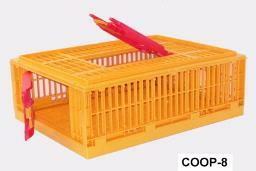 Coop can be used to transport game birds or poultry. Has a grid bottom. Size: 32” x 24” x 11”. Holds approximately 10-12 pheasants. Coop 10 has a sliding top door & an end release door; has a solid bottom. Size 38” l x 23” w x 10 ½” h. Coops 7 & 10 can be stacked with one another. Holds approximately 14-16 pheasants.